In this Horton Foote play; directed by Michael Wilson; Cicely Tyson plays the elderly Mrs. Watts who lives with her son Ludie and daughter in law Jessie Mae; played by Blair Underwood and Vanessa Williams, respectively. Ludie only wants what is best for his aging hymn singing mother; but the old woman is a thorn in the side to his wife. It’s worth noting that Ms. Williams’ portrayal of Jessie Mae is so spot on that you will despise her character within only a few moments of meeting her. Mrs. Watts lives off her “government pension check”, which never seems to arrive early enough to suit Jessie Mae. She has even instructed the local grocer to never cash the check for the older woman; making sure that she is using the check to pay for her room and board. 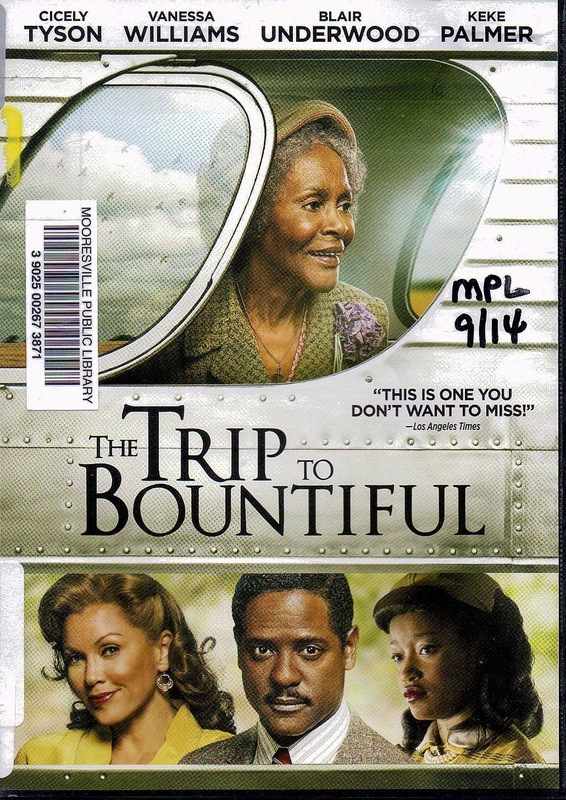 The elderly Mrs. Watts wants only one thing in life before she dies; she wants to return home for a visit to her hometown of Bountiful in Louisiana. Her memories of it are so vivid that she can feel the sea air wrapping around her face as she once did while sitting on her front “gallery”. As things in her son’s house get more and more difficult for the old woman to bear she hatches a plan. Hiding the monthly check from her daughter in law she packs her things when no one is home and goes to the bus station, intent on making the trip to Bountiful on her own. It is while at the bus station that she finds out Bountiful is nothing more than a ghost town between 2 other stops on the bus line. With her uncashed check and nothing but the $4.50 bus fare in change, she gets a ticket to the town 12 miles short of her destination. Waiting for the bus she spots her son and daughter in law looking for her. She eludes them with the help of a young woman named Thelma; played sweetly by Keke Palmer; whose husband has just left for “overseas”. She is returning home to stay with her parents during his absence. The two women sit together on the bus and find kinship with one another and the vagaries of life. They even sing hymns together; in sharp contrast to the older woman’s life at home, where her daughter in law forbids her to sing and her son is not man enough to stand up for her. Arriving in the town of Harrison at midnight; 12 miles short of Bountiful; Mrs. Watts discovers that she has left her purse, with the uncashed check in it; aboard the bus, which has now left and will not return until 5 AM. This turn of events coincides with the departure of Thelma on a connecting bus to her destination, leaving the older woman alone to spend the night on a bench in the bus station waiting room. But she is not really alone. Aside from her hymns she has the bus station’s elderly ticket agent to keep her company. She chats with him for a while before they both drift off to sleep; her on the bench and he behind the window of the ticket counter. When her purse arrives at 5 AM he elects to let her sleep until her son; who has phoned the local Sheriff; is scheduled to arrive to pick his mother up and bring her back to his home. Before that can happen though, the local sheriff; played by Clancy Brown, arrives and asks the agent to keep her there and phone him if she becomes unstable. Her daughter in law has portrayed her as crazy to the Sheriff in an effort to thwart Mrs. Watts’s efforts to elude her son. But the Sheriff is taken by the older woman’s pluck and agrees to drive her on out to Bountiful for a look at what is left of her old home. On the way the two are able to establish a rapport which transcends the racism and bigotry of the time and place in which this story takes place. As a matter of fact, the only times race relations come up in this movie are when you see the Colored Waiting Room signs and notice the attitude of the ticket agent in the first bus terminal towards African-American passengers. This laissez-faire attitude towards the “elephant in the room” does much to enhance the film. Without “beating the dead horse” the story is more focused on the human aspect of Mrs. Watts wanting to go home. And that’s something we can all identify with at one point of our life or another. In the end, Mrs. Watts gets to go home; via the courtesy of the Sheriff. And her son does arrive to pick her up; but not at the bus station, as planned. He too, must make that extra journey of only 12 miles; if only in order to understand his mother more fully. And, I think it’s fair to say that we all need to make that extra journey in order to understand one another. This was a delightful; and poignant; film.